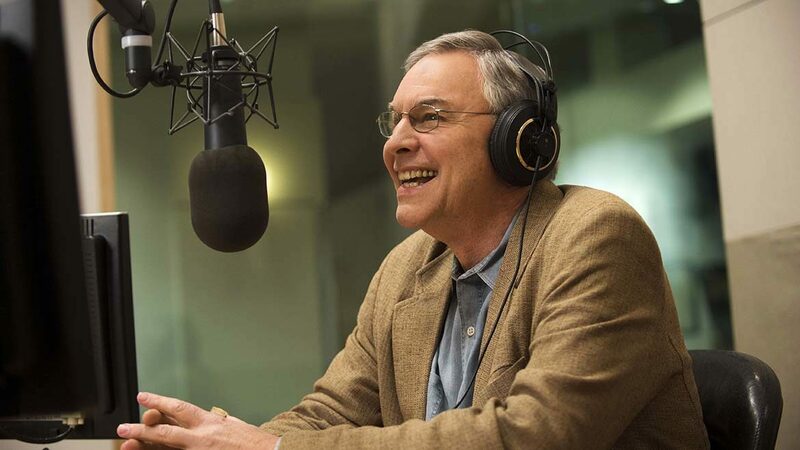 Littlefield, behind the mic at WBUR, delivers his final show Saturday. As longtime listeners of Only A Game are well aware, host Bill Littlefield has never hesitated to speak out about talented athletes who engaged in criminal behavior. But few of the show’s listeners know that it was a lawyer for two of the most famous athletes to be convicted in modern times who was indirectly responsible for Littlefield’s entree to WBUR. The station is marking a milestone as he hosts his final episode of Only A Game this weekend. In 1984 the Boston station aired a couple of sports commentaries by Alan Dershowitz, who helped defend Mike Tyson and O.J. Simpson, among other celebrity clients. Littlefield complained to Carol Rissman, then the station’s news director, about the Harvard law professor’s segments. Rissman asked Littlefield if he thought he could do any better. He said that he could. Thus began Littlefield’s 30-plus-year presence on Boston’s airwaves, starting as a local commentator on Morning Edition. A half-hour local version of Only A Game debuted in 1993 with Littlefield as host. The show expanded to an hour when it went national in 1994. 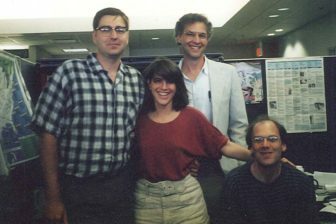 The show team in 1993, when Only A Game launched as a local broadcast, included Gary Waleik, Jennifer Loeb, Littlefield and David Greene. It was picked up by fewer than 100 stations that first year, according to David Greene, the show’s founding senior producer, who recalled the story of Littlefield’s start as a commentator. Carriage grew to 200 stations by 1997, the year that Greene departed; today 255 stations air the show. WBUR will continue producing Only A Game with a new host, but the search for Littlefield’s successor is still underway, according to a spokesperson. “I feel gratitude for all the people who kept listening and made it possible for us to do the work that we feel is important to do,” Littlefield said. “We’ve managed to cover stories that have been neglected or not covered enough by other people.” Only A Game made a point of reporting on women’s sports and was ahead of the pack in covering the football concussion story. Littlefield, 70, has juggled his radio-hosting duties with a career of teaching college and writing books. He has completed seven, edited several others and has an idea for his next novel. Ask the lanky, literate host what his fondest moments on the radio have been and he’ll cite his visit to the great sportswriter W.C. Heinz in Vermont, a parody of the Ken Burns baseball documentaries that focused on candlepin bowling and a series on the Roxbury Community College men’s basketball team. Littlefield produced eight pieces by regularly attending the team’s practices, games, classes and an end-of-season banquet. “They were a team at a level that nobody pays attention to. But they were great young men, many of whom were the first person in their family ever to attend college,” said Littlefield. Waleik was a production engineer at WBUR in 1985 and mixed Littlefield’s commentaries for Morning Edition. When the show launched, he became Only A Game‘s associate producer. He, Littlefield and Greene initially shared two desks in a WBUR cubicle. A member of the successful Boston rock band Big Dipper, it is Waleik who is responsible for one of the show’s most enduring features: Super Bowl Haiku. “Bill started cackling,” Waleik recalled. “Then he immediately started writing a few, and they were fantastic.” Waleik became senior producer in 1997 and served in that capacity until 2017; he’s now a producer. Every year the show gets hundreds of haikus submitted from listeners via email, voicemail and Twitter. WBUR staffers, including many who never sit in front of a mic, get to calmly recite the 17-syllable poems about the least serene sporting event. Given worked to widen the program’s definition of what constitutes sports, which has led to segments on belt sander races, skillet tossing and pumpkin chucking. She praises Littlefield for devoting so much airtime to women’s sports and women sports journalists. “Bill understands that, although he’s the outward-facing voice of the show, it takes a whole lot of people and a whole lot of hands to make it,” she added. Given and other colleagues also appreciate Littlefield’s ability to write quickly and write well. Greene recalled a commentary that Littlefield wrote in 1991, right after basketball player Magic Johnson announced he was HIV positive. Weekend Edition Saturday host Scott Simon, who emceed Only A Game’s 20th anniversary celebration at a theater in Somerville, Mass., said he, too, admires Littlefield as a writer. “I certainly hope that stepping down as host only increases his literary output, because I think he has some important things to say,” Simon added. Littlefield does have a book on the horizon — an idea for a novel about an old coach “looking back on glorious and horrifying events,” he said. He also plans to tutor incarcerated youth and volunteer with a Boston group called More Than Words. The nonprofit collects and sells used books, and in the process teaches at-risk youth how to run a business. After co-hosting “All Things Considered” for 30 years, the veteran broadcaster prepares to sign off. Forgive me for being crass but, what’s going to happen to the show after July 28th? Is the show ending? Is a new host being sought? Who’s hosting in the interim? These are important questions that are pretty relevant to the Current audience. Brad, The show will go on! A spokeswoman for WBUR told us the search for a successor is underway. I updated the story to add that detail. Well that’s good to know. Of course, it’ll be impossible to truly continue the show as it was. Bill was a unique presence…and your article did a good job capturing exactly how he’s like that. And it’s worth pointing out that Bill was and is a genuinely nice and caring person (and a nice and caring boss) in a work environment much better known for producing some real, ehem, “hard chargers” as of late.